When I first arrived in the Philippines, I thought what the heck is that purple stuff in the bowl of ice cream! How can anyone possibly eat food full of coloring additives and dyes? But it’s a natural plant and actually tastes pretty good. Its Latin name is dioscorea alata. Ube as it is known in the Philippines is a purple yam. It is used in a variety of desserts, as well as a flavor for ice cream, milk, Swiss rolls, tarts, cookies, cakes, and other pastries. In the Philippines, it is often eaten boiled or as a sweetened jam called ube halayá; the latter is a popular ingredient in the iced dessert called halo-halo. In Maharashtra, the stir-fried chips are eaten during religious fasting. Purple yam is an essential ingredient in Undhiyu. Purple yam is a popular dessert in Jaffna, Sri Lanka. It is also delicious used in cakes. And is often used in halo halo. Haluhalo or Halo-halo (Tagalog: [haluˈhalo], “mixed together”) is a popular Filipino dessert with mixtures of shaved ice and evaporated milk to which are added various boiled sweet beans, jello and fruits. It is served in a tall glass or bowl. Ingredients include boiled sweetened kidney beans, sweetened chickpeas, sugar palm fruit (kaong), coconut sport (macapuno), and plantains sweetened with sugar, jackfruit (langkâ), gulaman, tapioca, nata de coco, sweet potato (kamote), cheese, pounded crushed young rice (pinipig). Most of the ingredients (fruits, beans, and other sweets) are first placed inside the tall glass, followed by the shaved ice. This is then sprinkled with sugar, and topped with either (or a combination of) leche flan, purple yam (ubeng pula), or ice cream. Evaporated milk is poured into the mixture upon serving. Ice cream is certainly a boon during this hot weather we are experiencing at the moment. After all, it is summer in the Philippines! When I first came to the Philippines I too had an ‘aversion’ to purple ice cream. 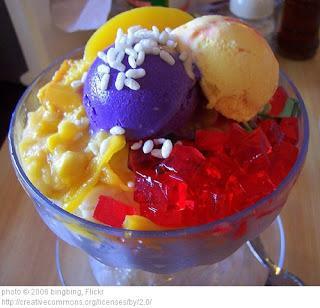 My asawa placed a big dish of it in front of me and said, “This is good.” It had of all things corn in it along with the other ice creams and colored gelatin cubes. Always being one to try new local cuisine I went at it. Well, it is an acquired taste 🙂 But the ube ice cream was very good. 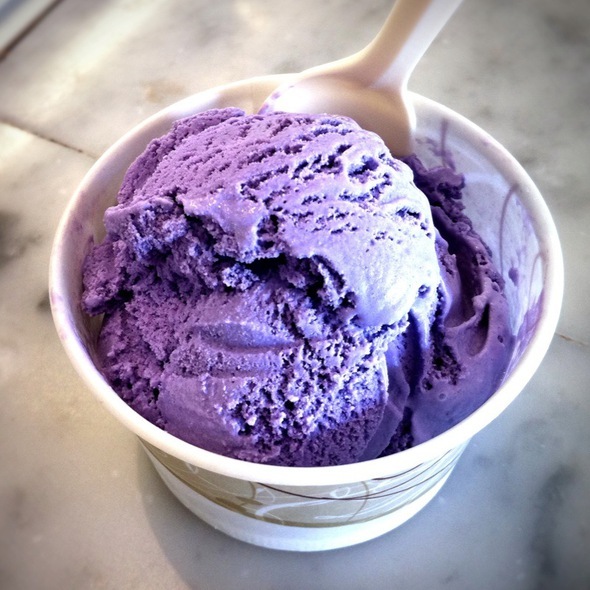 We buy ice cream with three flavors – chocolate, mango, and ube and it is a good combo. Though it will never surpass my favorite ice cream – Magnum bars – I do enjoy ube ice cream by itself. BTW Halo Halo reminds me of ‘Allo ‘Allo!’ a great British comedy. Nice post. Beautiful shade of purple. Another example of a plant/legume used in a sweet treat is red-bean paste in Japanese culture. Interesting about the red-bean paste. I think in British and North American culture, we tend to be suspicious of vivid colors in food. Many people in the west think ‘additives’ when they see colors in food.